Let's get real for a moment and talk about our health! Do you ever just feel... blah? I know I do, and for good reasoning. As moms, we take a lot onto our plates. No, not our actual plates, but those metaphorical ones that we are constantly juggling. We're constantly on the move, taking care of children, taking care of the home, taking care of our husbands... taking care of everyone but ourselves. All the running (and if you're like me, worrying) can seriously take its toll on your body... but what can we do to improve our health? The addition of a probiotic can help! You've probably heard people talk about probiotics in the past, but...what are they? Per WebMD, probiotics are live bacteria and yeasts that are good for your health, especially your digestive system. We usually think of bacteria as something that causes diseases. But your body is full of bacteria, both good and bad. Probiotics are often called "good" or "helpful" bacteria because they help keep your gut healthy. When you lose "good" bacteria in your body (like after you take antibiotics, for example), probiotics can help replace them. They can help balance your "good" and "bad" bacteria to keep your body working like it should. Now, we know what they are, but who needs them? What conditions can the aid in? Now, that we know what they are and who they might benefit--- which probiotics should we try? There are many great products on the market but not all products are created equal. 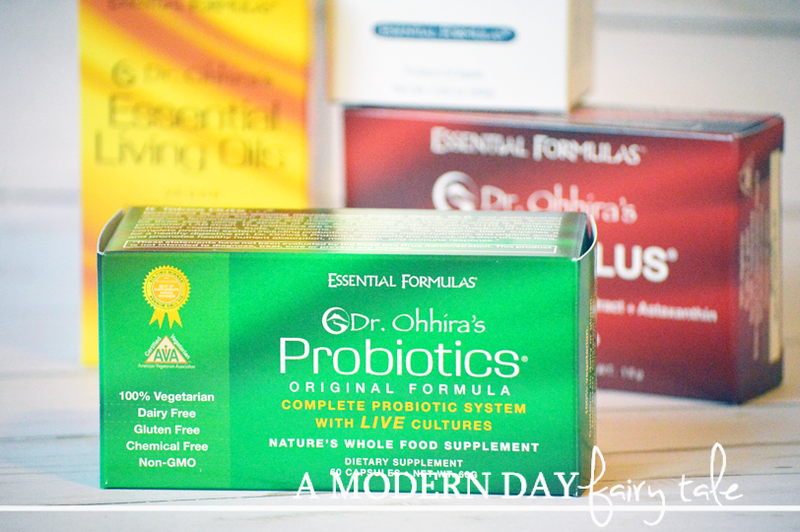 Today, I'm excited to introduce you to the award-winning Dr. Ohhira’s Probiotics®. 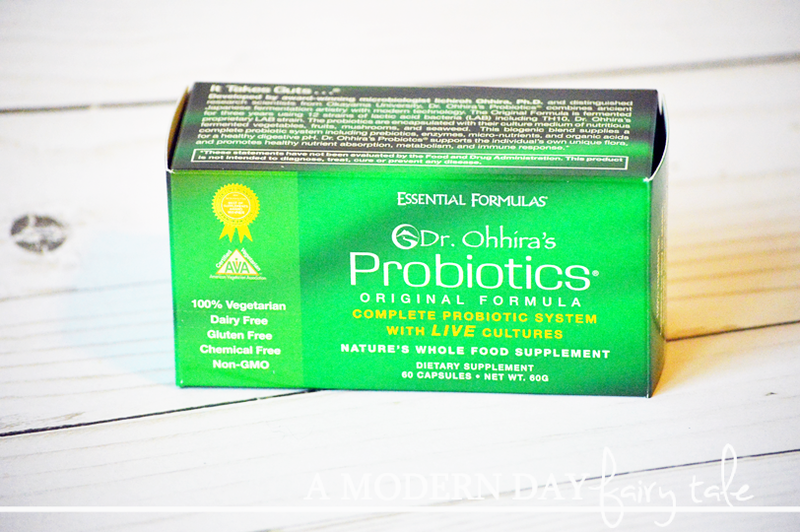 Dr. Ohhira’s Probiotics® is an all-natural, SUPERIOR PRO-BIOTIC developed to support digestive comfort, nutrient absorption and a healthy immune system. Unlike most other probiotic products, Dr. Ohhira’s Probiotics are not cultured or grown in a laboratory. Ingredients such as mountain spring water, fruits, and vegetables are fermented for three years with 12 distinctive probiotic strains. This rich culture medium (PRE-BIOTICS) is then encapsulated along with the probiotics that have grown together over the three-year period, and the resulting nutrients from this fermentation process (POST-BIOTICS). This allows the supplements to deliver viable probiotics and that encourage your body’s innate ability to grow its own friendly bacteria. But the real question I know that you want to know is--- does it work? I was given the chance to try out these great probiotics (and more), and I have to say that yes, I did see some improvement. I'm not saying that it was a miracle cure for everything that ailed me. Many of my health issues have another known cause, but I did find some relief, and that is definitely something! In combination with a healthy diet, this truly can make a difference in how we feel in our day to day. And as moms, we need that. We need to do this simple little thing that will help us to feel better not just for ourselves, but for our children too. 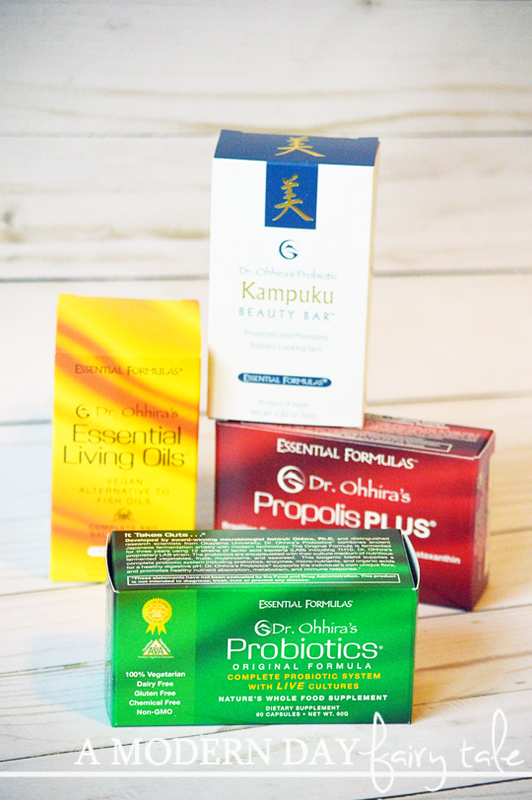 Dr. Ohhira’s Probiotics® might be what they are best know for, but they also offer more great products worth checking out too for even better overall health, inside and out. • Dr. Ohhira’s Essential Living Oils offers a vegan alternative to fish oil. Supplements contain eight natural plant and seed oils that are coldpressed, extracted, and prepared to provide plant-based essential healthy fats. • Dr. Ohhira’s Propolis PLUS fuses antioxidants with immune supporting components that support immune health, digestive function, and antioxidant support. Supplements contain Brazilian green propolis, flax oil Omega-3, prebiotic and probiotic support, and antioxidants vitamin E and astaxanthin. This vegetarian certified supplement supports joint comfort, immune support, healthy nervous system function, cardiovascular wellness, and overall digestive health. • Dr. Ohhira’s Probiotic Kampuku Beauty Bar nourishes skin by maintaining appropriate surface dermal pH and the appearance and integrity of collagen fibers. The beauty bar promotes healthy skin cell rejuvenation, hydrates and replenishes the skin, and supports the skin’s healthy barrier function. With 14 natural plant extracts, Kampuku provides chemical-free moisturizing, probiotic support, and natural deodorant benefits. This gentle but effective beauty bar is suitable for daily use on all skin types, especially very sensitive skin. Oooh such great stuff!! Ive never heard of them being used for anything beyond internally!! I will have to check them out!! I love my probiotics lol!! Hubby call s me the bacteria queen!! Wow! I nevertheless knew probiotics could help with fatigue and allergies! Good to know! I need to get some ASAP! fascinating! I've never heard of making a product like this by fermenting for years.